A Letter From Mitch Hurwitz. Mitch Hurwitz wants YOU to design the art for the Arrested Development Season 4 DVD cover. Crazy, right? Submit your best work now at Arrestedfanart.com! Contest ends tomorrow, September 16th!. Wallpaper and background images in the Arrested Development club tagged: photo arresteddevelopment fanart dvd contest comedy tvshow tvseries. 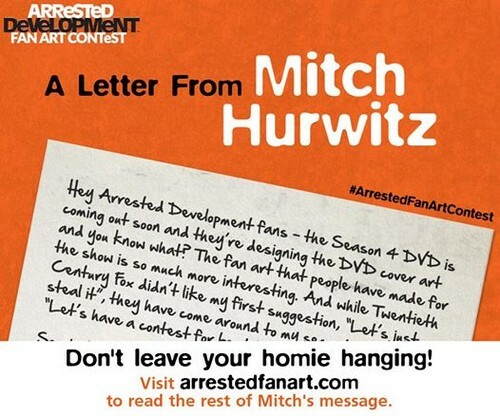 Mitch Hurwitz wants YOU to design the art for the Arrested Development Season 4 DVD cover. Crazy, right? Submit your best work now at Arrestedfanart.com! Contest ends tomorrow, September 16th!